Lansdown, Richard (2006) Strangers in the South Seas: the idea of the Pacific in western thought. University of Hawai'i Press, Honolulu, HI, USA. Long before Magellan entered the Pacific in 1521 Westerners entertained ideas of undiscovered oceans, mighty continents, and paradisal islands at the far ends of the earth-such ideas would have a long life and a deep impact in both the Pacific and the West. With the discovery of Tahiti in 1767 another powerful myth was added to this collection: the noble savage. For the first time Westerners were confronted by a people who seemed happier than themselves. This revolution in the human sciences was accompanied by one in the natural sciences after Darwin's momentous visit to the Galapagos Islands. The Pacific produced other challenges for nineteenth-century researchers on race and culture, and for those intent on exporting their religions to this immense quarter of the globe. As the century wore on, the region presented opportunities and dilemmas for the imperial powers, a process was accelerated by the Pacific War between 1941 and 1945. 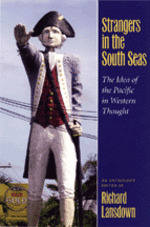 Strangers in the South Seas recounts and illustrates this story using a wealth of primary texts. It includes generous excerpts from the work of explorers, soldiers, naturalists, anthropologists, artists, and writers--some famous, some obscure. It shows how "the Great South Sea" has been an irreplaceable "distant mirror" of the West and its intellectual obsessions since the Renaissance. Comprehensively illustrated and annotated, this anthology will introduce readers to a region central to the development of modern Western ideas.